I just read a post on New Years Resolutions that is in perfect sync with my own thoughts. Check it out and let me know if you agree. This is a beautifully written and informative blog. First white Christmas in 140 years turned the garden into a Winter Wonderland! Both photos taken from the veranda. Too cold to go out, although it was much warmer than any day I spent in Montreal! I am just such a Southern Belle now! It was all gone the next day. Blooming today, (Chionanthus praecox) Wintersweet. Definitely a gift! The first and very early Lenten Rose (Helleborus orientalis). The Winter Garden… full of unexpected surprises! embellished with a cookie Press from my dear, late friend Erik. He loved these. I call them Erik Cookies. Three ingredients; flour, sugar & butter. and of course the favorite Oatmeal raisin with pecans. waiting for the day after Christmas. Traditionally that is when we start planning the Potager. Just back from Montreal. 30 cm (17″) of snow fell the day I arrived! Photo above taken from the window. I would not venture out in that!! Back in Georgia…for another cold snap but NO SNOW!!! I’ll post when I thaw out! 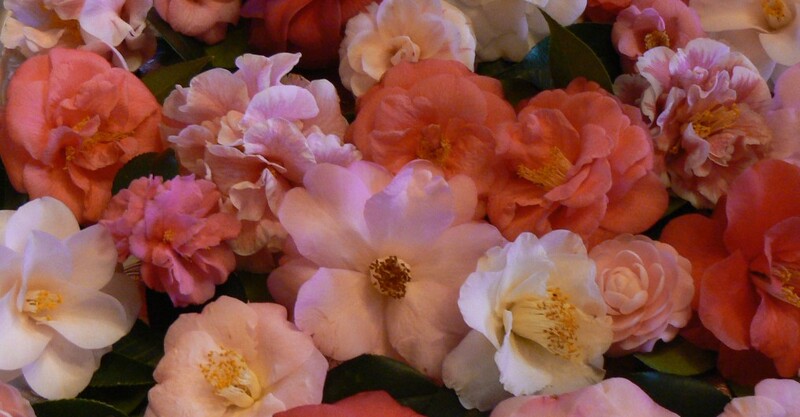 I, am drunk with Camellias! Below, it is the Camellia Walk which forms the background for the Mourning Bench. In the Potager, below, a salad Garden, some collards & cabbages. In the Cutting Garden, the seeds of the Lilies (Lilium formosanum)are ripe. Please e-mail me if you would like seeds. There were some request after I posted the flowers, HERE. AND… The Continuing Saga of yet another project…. An improvement since the last time I posted this spot. I will be away from the computer for a week. Will fill you in when I return.